Stuck with a tiny yard? Transform your small outdoor space into a beautiful and functional escape with these luxury landscaping ideas. A small backyard looks totally stunning with a luxurious modern landscape design.Use the same design principals outdoors as you would inside, whether you’re style is eclectic, modern, or traditional.The key to making a big impact on a small footprint: design to scale. 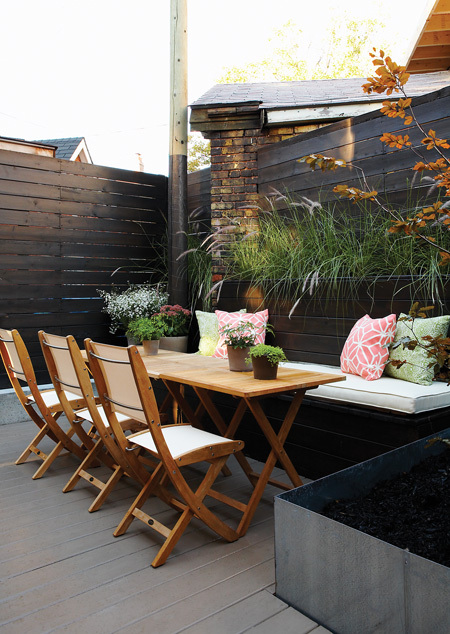 Dividing a section of the yard into a seating area makes a backyard appear larger. 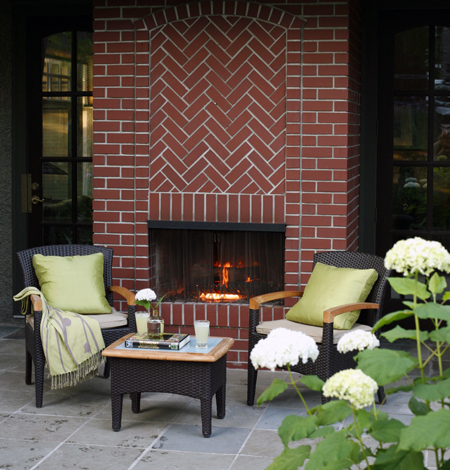 Having several distinct cozy outdoor living spaces is all about being smart with the space you do have. A sitting area is made more intimate and private by adding an arbour overhead. Remember that backyards don’t always have to be swathed in grass. Instead, create an inviting terrace with a stone or concrete floor. This way, plants and flowers take centre stage without competing with green grass. 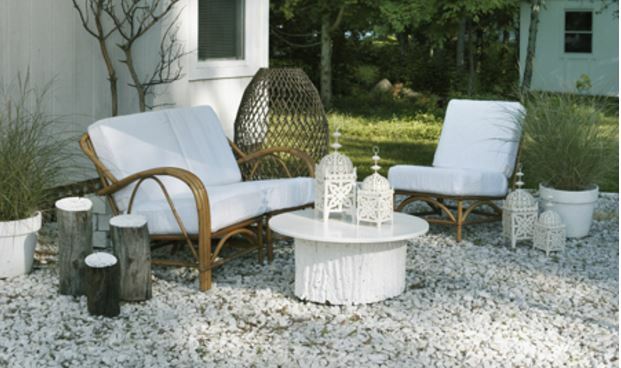 Also, choose simple patio furniture to keep your space from looking too busy. 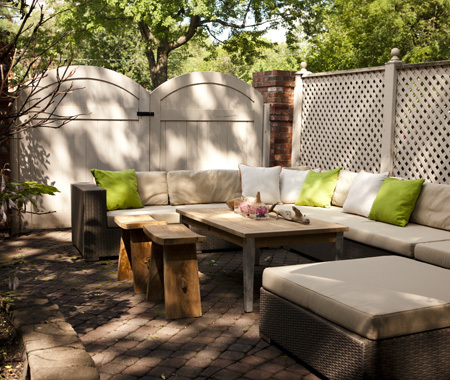 A trellis fence adds texture as wallpaper would and modular sectional seating can be rearranged for entertaining. Adding a small table and stools keeps the furniture within the scale of your small space-and gives more freedom to add and remove according to the amount of company. Don’t forget the throw pillows in a weather-safe outdoor fabric add a punch of colour! You don’t need a grand pool to add water as a design element in your space. 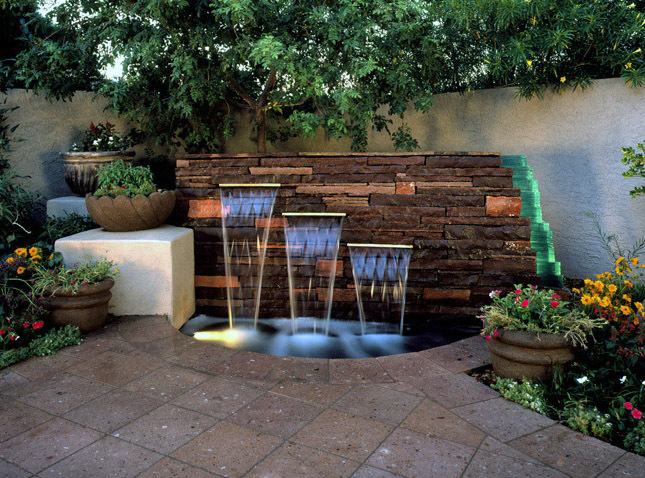 Installing a small water feature is a stunning way to add elegance to your outdoor space. The soothing sound and flow of water gives the impression of serenity and opulence. A small water feature can be many things — a fountain, waterfall, rock pond or birdbath. It can take many forms and use flowing or standing water to enhance an outdoor area.Not only are they beautiful, but these additions will offer you and your guests a nice, tranquil and relaxing outdoor space. If you only have a deck to work with, a built-in banquette provides plenty of stylish entertaining space. You can dedicate the space to one large dining table, which provides a versatile space for formal dining or cocktails and conversation. Whether you’re just serving up a casual dinner for your immediate family or you’re planning a small bash with friends, a deck can provide an opulent setting. Adding in plenty of lighting, surrounding plants and hidden speakers will instantly set a luxurious atmosphere. Just like any indoor space, this exterior can be customized to your wants and needs. Shady overhead structures, and spa-like amenities are all within the realm of small deck design possibility—with a little planning. A fireplace keeps guests warm on a cool night. It can be a fire pit or a fireplace, wood-fueled or gas. 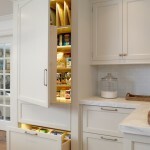 The styles vary tremendously, allowing you to find the perfect model for your small space. They make great gathering point for friends and family. A few arm chairs and a small table are all that’s required for complete relaxation near a blazing fireplace. It also helps illuminate your outdoor space making the area feel cozy. Additionally, there isn’t a kid in the world who doesn’t love a fire pit in the backyard! A fire sets the scene for the most popular lounge spot of your home. 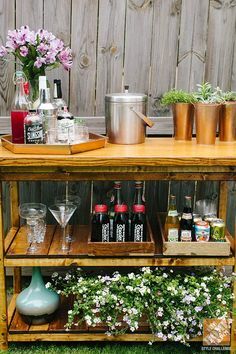 If you desire to use your backyard primarily for entertaining, but don’t have room for an outdoor kitchen or dedicated bar complete with stools, bring the bar to your lounge space! Build a shelf onto your fence to allow for a bar area, with a chic graphic mirror to adds a focal point and bring a bit of the indoors outdoors! Another option is turning a beautiful kart into a bar-replete with ice bucket, spirits tray and a variety of elegant glassware. Remember that more space isn’t always better. Small spaces are equally able to provide a place to entertain, relax and frolic in the sun (or shade if you prefer). Take these tips and a dose of inspiration to maximize your time outdoors for the ultimate luxurious landscape. 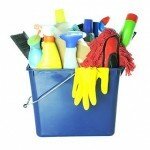 For more ideas visit the Mosaik Homes Facebook Page!